Colleen is NO LONGER taking on new Behavior Modification clients. Below is a list of frequently asked questions. Click on the direct links below to take you to your specific question or scroll down through the entire page. Why do I need a consultation to learn how to modify my dog's unwanted behavior? What is involved in a BM (Behavior Modification) consultation appointment? Where will the BM consultation take place? What areas will Colleen travel to for her standard consult fee? How do I schedule a BM consult appointment with Colleen? What equipment do I need to have on my dog for the appointment? Who should attend the appointment? How do I video my pet? 1. Why do I need a consultation to learn how to modify my dog's unwanted behavior? Scheduling a behavior modification consultation is the best approach for modifying your companion dog’s unwanted behaviors. Simply teaching your dog basic manners like Sit, Down, Stay, Come (which are taught in basic obedience classes) will not prevent or solve unwanted behaviors such as aggression, excessive barking, fear, anxiety, handling, and destruction issues. Canine behavior is highly complex and every dog is an individual with a unique learning history and genetic background. So, a behavior modification strategy that works well for one dog in a particular home environment, may not work at all for another; that is why it is best to develop a customized approach for modifying your dog’s unwanted behaviors. Furthermore, there are common and well as unique (specific to a particular dog) areas of conflict within the home as well as out in public. So, being aware of these situations and learning how to avoid, manage, and modify your dogs’ reaction are the focus of the behavior modification training plan. If you'd like to learn more about the role of a Behavioral Consultant, click here to read a nicely articulated blog on the AVSAB (American Veterinary Society of Animal Behavior) website. The blog provides a much more in-depth description of the process required to develop and implement a successful intervention. 2. What is involved in a BM (Behavior Modification) consultation appointment? During your behavior modification consultation appointment, we will review the detailed history of your pet’s behavior including all circumstances and events that could be triggering the unwanted behavior(s). We will then discuss the individual components of the overall behavior modification strategy and work together to develop a customized approach and training plan all members of your family feel they can commit to executing. We will wrap up the session with any pertinent training demonstrations and discuss any remaining questions. You will also be given detailed written instructions outlining the plan we discussed, typically within 48 to 72 hours after the consultation appointment. Because there is a lot of ground to cover to identify all the pertinent components of the BM (Behavior Modification) plan, the behavior consultation typically requires 1.5 to 2 hours to complete. 3. Where will the BM consultation appointment take place? The behavior modification consultation can take place in the client’s home or at the trainer’s residence located in Phoenix MD. There are certain circumstances when Colleen will want at least the first BM consultation to take place at her facility in Phoenix MD (for example, with cases of territorial aggression, or in certain cases of people reactivity/aggression). She will decide the best location for the BM consultation after reviewing the completed Behavior History Form and after considering all discussions with the client. Her decision will be made based on (1) considering the client's wishes, (2) needing to provide the best learning environment for the dog, (3) needing to provide the best environment for Colleen to accurately assess the dog and all underlying motivating factors contributing to the dog's unwanted behavior(s), and (4) needing to provide the safest environment for Colleen to work with unfamiliar dog(s). In some cases that will be in the dog's home environment and in other cases, it will be at Colleen's facility. If you are not open to Colleen deciding on the location of the BM sessions as an option, there are several other trainer/behaviorists in the MD area that may be better suited to meeting your needs - click here for a list of trainer/behaviorists referrals. Also, if you live outside of Colleen's standard travel area (see point 4 below), it's typically possible to hold the BM consultation at Colleen's facility in Phoenix MD in order to waive the travel fee. Just let her know if that's what you'd like to do. 4. What areas will Colleen travel to for her standard fee? Colleen is located in Phoenix MD and is available for behavior modification consultations at the client's home for the following Baltimore suburbs: Baldwin, Bel Air North, Carney, Cockeysville, Fallston, Forest Hill, Fork, Garrison, Glen Arm, Glencoe, Hereford, Hunt Valley, Hydes, Jacksonville, Jarrettsville, Lutherville-Timonium, Mays Chapel, Montkon, parts of Owings Mills, Parkton, Perry Hall, Phoenix, Pleasant Hills, parts of Reisterstown, Sparks, White Hall, and White Marsh Maryland. Colleen is available for in-home consultations outside of these areas for a travel fee in addition to her standard consult fees. Contact Colleen directly for an estimate of the travel fee, which is dependent on travel time from Phoenix. Or alternatively, the client may travel to HTDT's facility in Phoenix MD to waive the travel fee. 5. How do I schedule an appointment with Colleen Griffith? Inquire about scheduling times: contact Colleen via her on-line form (click here to email Colleen) and give a brief description of your dog's unwanted behaviors. Colleen will let you know of any possible long wait times for scheduling appointments, and if the wait times are unusually long (4 weeks for example), she will provide some recommendations of trainers who may be able to help you in case you don't want to wait. Typically consultations can be scheduled for roughly two weeks after Colleen receives the completed Behavior History Form (see below) which contains the detailed information regarding the behaviors you're interested in modifying. Schedule a tentative appointment: once Colleen has informed you of her wait times, she will schedule a tentative appointment with you. Once Colleen has received your deposit, a copy of the signed training agreement, the completed behavior history form, and proof of your pets immunity (see below for instructions on how to submit these documents), then she'll book and hold the appointment on her calendar. If she doesn't receive ALL of those items by the end of 7 business days after agreeing on the tentative apointment, then you'll forfit your appointment date and time and it will be offered to another client. Submit your deposit: Click here for a list of her rates. You can pay via PayPal (click here for the PayPal payment button) or send a check by mail. If you'd like to send a check by mail, let Colleen know and she'll give you the appropriate mailing address. Sign and submit the training agreement: read, complete, sign, and submit a copy of the Behavior Modification Consultation Policies and Agreement form (click here to download a copy). Once you complete and sign the form, you can scan and email it to Colleen, or fax it, or mail it (ask Colleen for her fax or mailing address if you prefer either of those options). Complete and submit your Behavior History Form (BHF): a prerequisite for scheduling appointment is completing and submitting a Behavior History Form (BHF) for your dog (click here to download the BHF). You may scan and email, or complete electronically and email, fax, or mail the completed BHF (ask Colleen for fax or mailing address if you prefer either of those options). Provide proof of immunity: send Colleen copies of your dog's proof of vaccinations (or sufficient titers demonstrating immunity) a minimum of 7 days prior to the scheduled appointment. You may email, fax, or mail the documentation or ask your vet to send the information directly to Colleen. Finalize your appointment: once Colleen receives a copy of the completed Behavior History Form, your deposit, your completed and signed training agreement, and proof of immunity, she will schedule and hold your appointment. Note, if she doesn't receive ALL of these documents within 7 business days after the date when she agreed to the tentative appointment, you'll forfit your appointment time and it will be offered to another client. Prepare for your consultation: review the other FAQs on this page as well as the Appointment Requirements and Deadlines page. Pay close attention to what you need to bring to the appointment as well as the equipment your dog needs to be wearing during the appointment. Video your dog: video your dog's unwanted behavior(s), if safe to do so, and then email or post the video(s) before the appointment. If you will be traveling to HTDT's facility for your appointment, video a representation of your dog's entire home environment and bring the video with you to the appointment. Scroll down below to section "9. How Do I Video My Pet" for video tips. HTDT LLC consultation fees are based on our expertise, individualized treatment plans, length of appointment, and time spent via email and phone support after the initial consultation; they are comparable to those of other behavior consultants with a similar educational and experience background in behavior modification. 6. What should I do prior to my appointment? There are several things you can do to help prepare for your appointment. Because safety is always our foremost concern, be certain to exercise safety precautions if your pet is aggressive or reactive. Do not put your pet into situations that are potentially dangerous to him/her, yourself, your family, other people, and/or other animals. Video: if it seems appropriate to help understand your pet’s behavior, you should bring a video of your pet displaying the unwanted behavior (see the next section on videoing). Carefully think through and write out detailed answers on the Behavior History Form (BHF). Utilize your notes and or journal, per the above bullet points, to help you with answering the questions. Filling out this document as thoroughly as possible is very important – it is what allows Colleen to understand the dog’s behavior history and subsequently develop a successful behavior modification strategy. Without a good understanding of the dog’s behavior history, including the dog’s “triggers”, it’ll be much more difficult to develop an effective BM strategy. For rescued dogs, just include as much information you have from the rescue agency as well as your own personal experience since you’ve adopted the dog. You can type out your responses via computer or fill out the form by hand and email it or send by post office, 7 days before your appointment. 7. What equipment do I need to have on my dog for the appointment? For the appointment, you will also need to have a minimum of two pieces of equipment, attached to a 6 foot leash, on your dog at all times: you’ll either need a well-fitted buckle collar plus a front-clip harness or a head-halter plus a buckle collar. My favorite front-clip harnesses are a SENSE-ation harness or freedom harness and my favorite head-halter is the NewTrix head halter (you can find links to these on the Equipment tab on my webpage) or a Halti. It’s preferable to have your dog wear a well-fitted leather buckle collar with all-metal rings since collars with plastic snap-closures do break. If your dog is wearing a buckle collar and front-clip harness, clip the leash through both simultaneously. If your dog is wearing a head-halter and buckle collar, ensure the head-halter is clipped to the dog’s collar and the leash is clipped to the head-halter. If you’re unable to comply with this request, or have any questions, be certain to discuss this with Colleen prior to your appointment, so the best path forward can be determined. These equipment requirements apply to both visits at the client’s home and consultations that take place at HTDT’s facility. No limited-slip, choke chain, or prong collars please. 8. Who should attend the appointment? Everyone who is involved in the regular care of the family should attempt to attend the appointment. This is so that they can all give input into the history of your pet’s unwanted behavior(s) as well as be present to understand the details of the behavior modification strategy and training plan. If everyone involved in the regular care of the pet doesn’t fully understand and consistently follow the recommended training plan, it will be less effective. 9. How do I video my pet? As mentioned before, please exercise safety precautions if your pet is aggressive or reactive. Do not place your pet in situations where he/she is in danger or where you, your family, other people, and/or other animals are in danger. One is to visualize where your pet spends his/her time so that I can better understand your particular situation (this is important only if the BM consultation will take place at HTDT’s facility instead of the client’s home). Another reason is to see your pet’s relationship with you, your family members, and other household pets if applicable. And it’s certainly helpful to see the unwanted behavior in action, ONLY if possible and appropriate to video. If you do not own a video camera (including the video camera on most smart phones today), perhaps you can borrow one from a friend. The length of the video does not need to be more than a few minutes, unless you’re videoing your pet when you are out of the house. And it’s unnecessary to clean or tidy up your house for the video, since it will only Colleen will see it. If you’re going to video your pet with suspected separation anxiety or compulsive disorder: do not video him/her if you feel that your pet will harm himself/herself. Also, set up a video camera in your house WHEN YOU ARE NOT HOME. Place the camera to view as much of the area of the house as possible where your pet spends most of his/her time when you are gone. Please also try to capture a brief video of your pet when you are with him/her, and especially try to capture the unwanted behavior in your presence (if safe to do so). If you’re going to video your pet that is fighting with other household pets: As always, EXERCISE SAFETY PRECAUTIONS. There should be no chance of injury from any of your pets to the other(s). If necessary, they should be separated by a leash and/or behind gates or glass doors. Much can be determined by the body language between the pets alone. If your pet is aggressive towards people: do not put your pet in a situation where (s)he could be aggressive towards people, even if you feel it’s safe to do so. Please also try to video your pets in normal situations, such as during play, resting, on walks, in your yard, and/or while interacting with different family members. 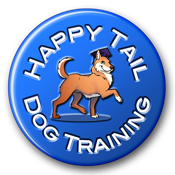 © 2012 - 2018 Happy Tail Dog Training LLC. All Rights Reserved. Materials not to be copied, distributed or used without prior written consent. Copyright 2012 - 2019 Happy Tail Dog Training LLC. Logo Character Drawing Copyright 2013 Robin King Art. All rights reserved.